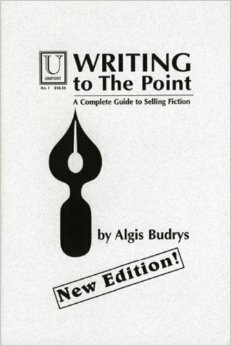 I recently came across a book by Algis Budrys, which I had never heard of before. The book, called Writing to the Point, has been one of those watershed moments in my life of writing. I have spent many years trying to write and never quite grasping some small detail that seemed to leave most of my works flat or unfinished. The book is not in print, as far as I know, and I was able to secure a used copy of it from a thrift store back east. When it showed up, I devoured the book. After one time through, I realized that Mr. Budrys was teaching the detail that I had been missing. I won’t try and rehash his work, just trust me when I tell you that if you want to write but have been struggling–give his book a try. With a little bit of coaching from Mr. Budrys, the work you begin to produce will be much better than you were producing. With a bit of practice, you may even begin to sell some of your work.